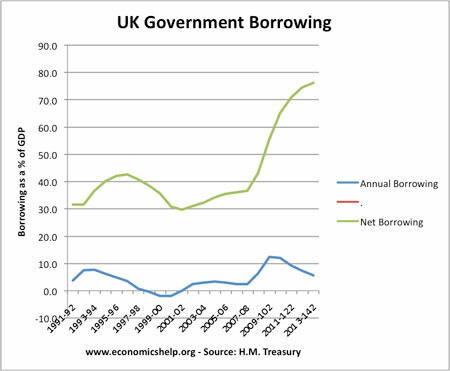 UK national debt as a % of GDP compares the total size of government borrowing to the size of the economy. 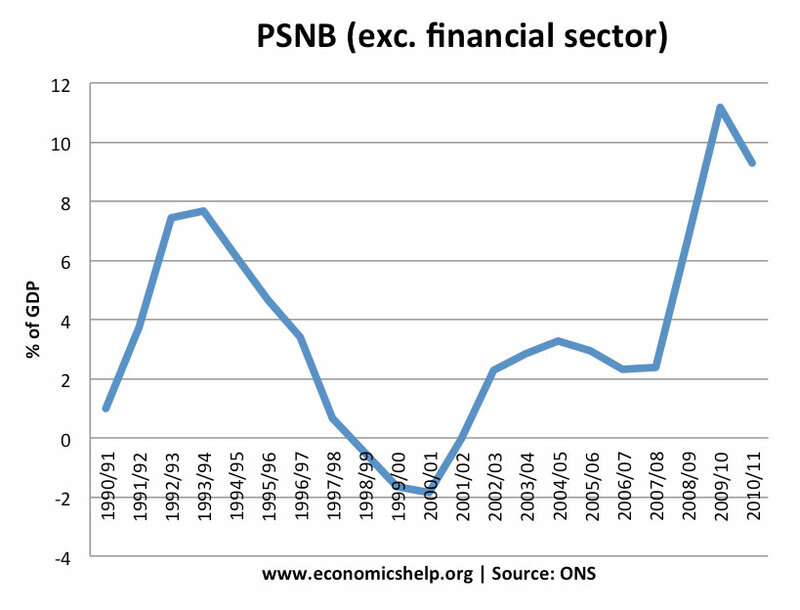 In this graph, public sector net debt excludes the effects of financial sector intervention. 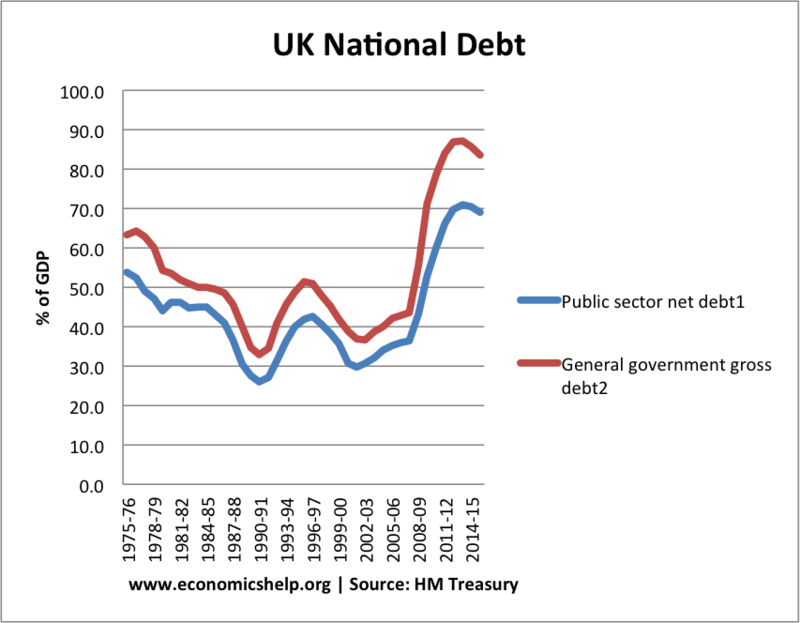 Gross government debt is a wider definition of public sector debt. 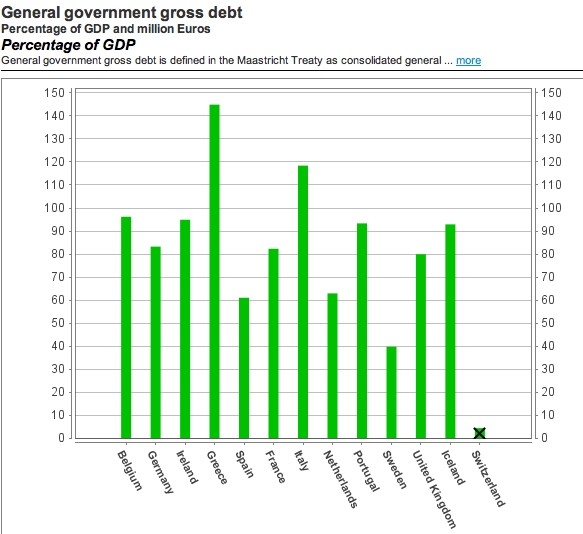 It is useful for making comparisons with other European countries, who tend to use gross government debt. List of other countries debt. The budget deficit (public sector net borrowing) PSNB is the annual total the government needs to borrow to meet its shortfall between spending and tax receipts. In the post war period, economic growth has averaged 2.5%. 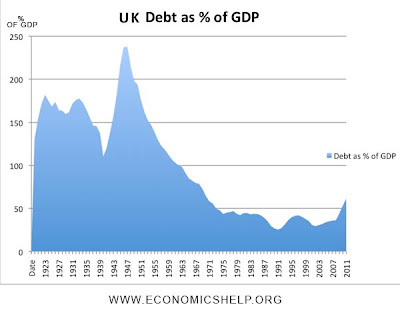 Therefore, if the real level of national debt stayed the same as a % of GDP it would fall. If real levels of national debt increase by 2.5% a year and we have economic growth of 2.5%, then national debt as a % of GDP will stay the same. Assuming constant interest rates, the cost of servicing the national debt (paying debt interest) should stay the same as a % of GDP. Therefore, tax rates would not have to rise. However, if national debt as a % of GDP rises, then debt interest payments will also rise as a % of GDP, therefore a bigger share of tax revenue will have to be used to meet the debt interest payments. 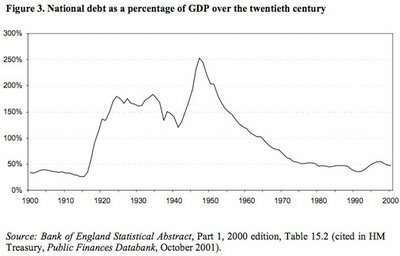 Another problem of debt rising as a % of GDP is that markets may become more reluctant to buy the debt from the government. If markets fear the government may default, it becomes very expensive and difficult for the government to sell the debt. At the moment, this is not really a problem for the Debt Management Office DMO. But, it could be in the future. “However, if interest rates rise, then the UK will be facing a higher cost of servicing debt”… sounds exactly the same as what’s happening in Australia at the moment. If interest rates jumped up to the same levels as 1989, it would break a lot of people. I agree people are in trouble if interest rates go up, even slightly.